Paying taxes is the most dreaded time of the year. It feels good to pay the government the least amount of money. When preparing your federal income tax return, you will want to seek every possible deduction to reduce the amount of tax money you may owe. One way to make a reduction is by claiming your children or other qualifying relatives as dependents. Each dependent claimed lowers your total taxable income by one exemption. You can save thousands of dollars on your taxes by claiming dependents. For every qualified dependent claimed, you could reduce your 2017 taxable income by up to $4,050. However, there are rules for claiming someone as a dependent; below explains who can or cannot be claimed on your tax return. There are two types of dependents: a qualifying relative and a qualifying child. A qualifying relative is a person who meets the IRS requirements to be your dependent for tax purposes. If someone qualifies you can claim them on your tax return. Despite the name, a qualifying relative does not have to be related to you. There are four qualifying relative requirements that an individual must meet to be considered. First, an individual cannot be your qualifying child or someone else’s qualifying child. They are a qualifying child if they meet all the requirements, whether or not they are claimed as a dependent. Secondly, a person must either have lived with you for an entire year as a member of the household or be related to you in one of the following ways: your child, stepchild, grandchild, son-in-law, daughter-in-law, brother, sister, half brother, half sister, step brother, step sister, brother-in-law, sister-in-law, parent, step father, step mother, father-in-law, mother-in-law, grandparent, aunt, uncle, niece if related by blood and nephew if related by blood. Thirdly, the person being claimed must have made less than $4,000 in gross income during 2017. Lastly, you must have provided more than half of the individual’s total support during the year. 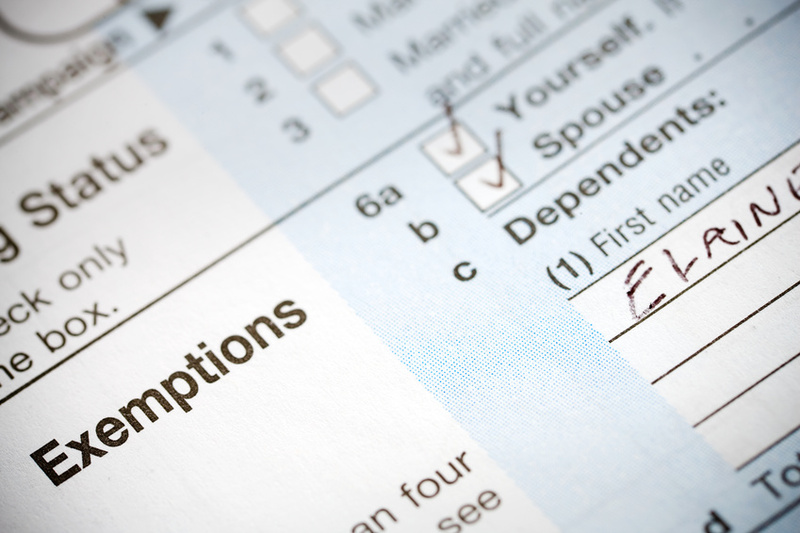 In addition to the qualifying requirements, the dependent being claimed must be a U.S. citizen or U.S. resident, cannot be claimed by someone who took a personal exemption for himself or claimed another dependent on his tax form and cannot claim someone who is married and files a joint tax return. Even if a qualifying dependent did not live with you for the entire year, there are a couple circumstances that would allow them to still be claimed. If a qualifying relative is placed in a nursing home, they are considered to be away on a temporary absence and can be claimed. If someone died during the year but lived with you as a member of your household before they passed away, they are considered to have lived with you for the entire year. If a child was born during the year they are also considered to have lived with that person all year. In the case of a birth or a death, any related hospital stay is considered a temporary absence and can be claimed. If claiming an individual, you must also consider the multiple support agreement. If you and one other person provide more than half of a person’s support and meet the qualifying relative requirements, you can agree between yourselves who gets to claim the qualifying person as a dependent. Only one person can claim the individual and receive an exemption. A signed statement agreeing to the claim between the individuals must be signed and kept for their records. The other type of dependent is the qualifying child. A child must meet either the qualifying child test or the qualifying relative test. The requirements for qualifying a child are: the child must be younger than you, younger than nineteen or be a student younger than twenty-four as of the end of the calendar year. There is no age limit if the child is permanently disabled or meets the qualifying relative test. Although determining if a person can be claimed as a dependent is confusing, there are only a few requirements that need to be met and the benefits of exemptions are immense. If you have questions determining if someone is a qualifying child or relative, please call Scott, Horewitch, Pidgeon and Abrams LLC at 847-850-5300. We would be happy to help you. Have a happy holiday!